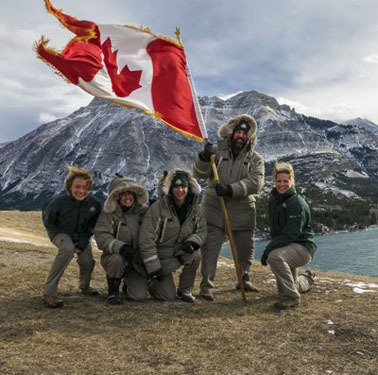 Happy Flag Day Canada from the staff at Waterton Lakes National Park, Alberta. Up here in the brrrrr … cold wilderness north of the Great Lakes, Monday, February 15, 2016 is a day when two commemorations coincide. Both have been written about in the past on this site. And in commemoration of both commemorations today, we are going to quickly review these past writings, and then end on two new notes. As an ultimate added attraction, the second and final of the new notes involves some striking words from our current Prime Minister of Canada, Justin P.J. Trudeau — the remarkable blend of Montreal and Vancouver that those of us whose fate is to reside in Toronto (and elsewhere?) can only marvel at in a state of incomplete comprehension. Hon. Maurice Bourget, P.C., B.Sc.A. 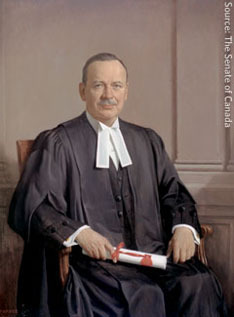 MP Levis, Quebec 1940–1962, Speaker of the Senate of Canada, 1963–1966. 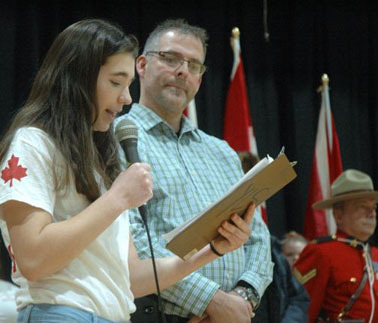 Allison Perry, co-president of the Memorial Club in Yarmouth, Nova Scotia, gives a reading during National Flag of Canada Day ceremony, as Frank Grant of Yarmouth Recreation, MC for the event, looks on. ERIC BOURQUE PHOTO. Down here very deep on the ground of this wild political blogazine (as we’ve been told) we actually had two Canadian flag-day-related postings last year : “Standing up for Canadian flag’s 50th birthday .. and Sarah Palin, Emma Holten, migrants to Canada and USA,” on January 31, 2015 by Citizen X ; and “Ontario’s flag flap 2015 .. and its own burden of history from just before (and after) the War of 1812,” June 22, 2015 by we collective Counterweights Editors. We don’t want to take up time with either of these pieces now, Except to say that “Standing up for Canadian flag’s 50th birthday” does include an introduction to the BC meteorologist Alistair B. Fraser’s Canadian flag history on the world wide web — probably the best thing of its sort — along with some daring thoughts from the Danish journalist Emma Holten. Danish journalist Emma Holten, deep in thought. And in 2016 this does seem quite crazy to us! As Mr. Adam says : “Put the Canadian flag first.” Why not? 2. 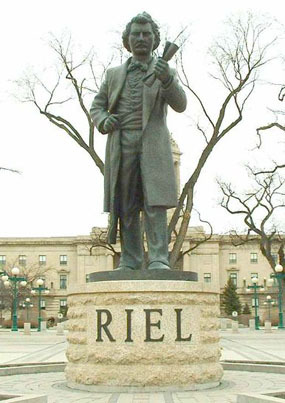 Louis Riel Day in Manitoba and … ???? Statue of Louis Riel on Manitoba Legislative Building Grounds, Winnipeg. The second great matter of commemoration today is known in some Canadian provinces (such as the one we are writing from right now) as Family Day — the third Monday in February, when to some but not all Canadian provincial governments the rigours of the northern climate have accumulated to the point where the hardworking sovereign people deserve a holiday. But in the forward-looking and future-oriented province of Manitoba (in some ways : note contradictory provincial flag questions above), the holiday on the third Monday in February is known as Louis Riel Day — in honour of the leader of the two great Canadian Metis rebellions of the later 19th century. 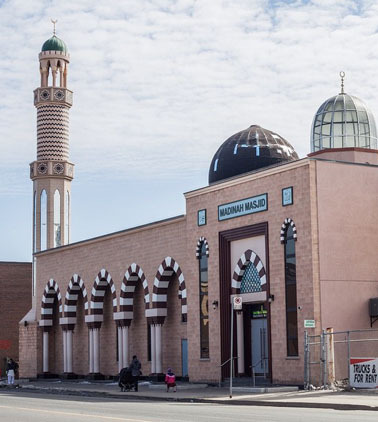 Photo : Graham Hughes/Canadian Press. Some half a dozen years later, and of course under another political regime, on Monday, February 15, 2016, we are pleased to see a “Statement by the Prime Minister of Canada on Louis Riel Day” that at least moves the ball some welcome and surprising yards ahead. Happy flag day from model Valerie Poynter, putting together a short visual piece in celebration of Canada Day 2012, with help from photographer Spencer Edwards. We haven’t agreed with everything Justin Trudeau’s new government has done over its first 100 days and so forth. No one will. But it is hard to resist some fresh respect for the renewed Search for Canadian Liberalism when the prime minister says things like this. Now … what about it? Will he finally declare the third Monday in February a federal as well as a sometime provincial holiday called Louis Riel Day right across the country, coast to coast to coast, next year in 2017, to help celebrate the 150th anniversary of the Confederation of 1867? Whatever, even if this never quite happens, in joining “the Métis people, Manitobans, and Canadians across the country to commemorate Louis Riel” today Justin Trudeau has started to reopen some of the doors Stephen Harper seemed to be working so hard to close. And like many others we very much welcome that. 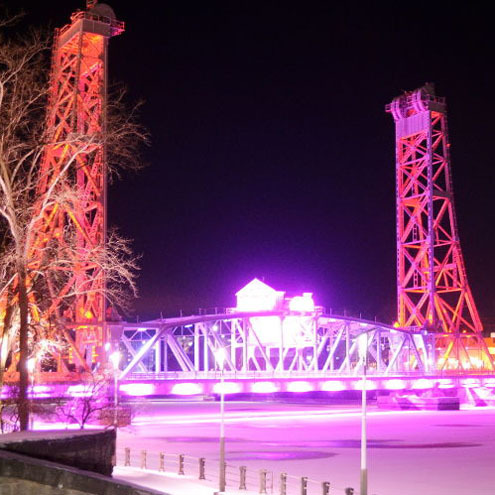 Main Street Bridge in Welland, Ontario lit with red and white colours early on the morning of February 15, 2016 to commemorate 51st anniversary of Canada’s Maple Leaf flag. Or as the prime minister has said, 51 years later : “The ideals that Louis Riel fought for — ideals of inclusiveness and equality — are now the very same values on which we base our country’s identity.” Amen to all that. And Happy Louis Riel Flag Day Canada, wherever you may be.